Acceleration due to gravity is 10 N/kg. The surface area of fish pressed by the water above it is 6 cm2. Determine the force of water above fish that acts on fish. 1 mm Hg = ……. Pascal? 3. Above the surface of the sea, the height of mercury in a barometer is 760 mm. If at a place, the height of mercury in a barometer is 700 mm. Determine the pressure of air at that place. 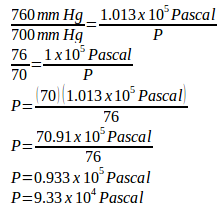 700 mm Hg = ……… Pascal?